What should doctors and the organizations that employ them do to address this epidemic? 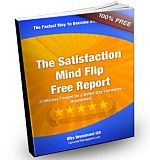 Dike Drummond MD, CEO and Founder of TheHappyMD.com announced today that he personally delivered the Burnout Proof Live Workshop to over 10,000 physicians, in 300 separate trainings, for 48 corporate clients in the calendar year of 2016. This flagship workshop teaches the signs, symptoms, causes and effects of physician burnout. Attendees also learn how to recognize burnout in themselves and others and how to both reach out for and accept support. 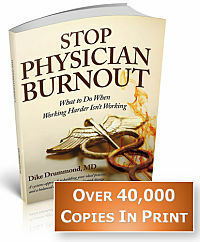 “All physicians graduate with a gaping hole in their medical education around stress management and burnout prevention. Our workshop fills that hole in a public forum and starts to shift the culture of the organization. Doctors learn a common language to describe the experience of burnout and are able to both ask for help and offer help -- perhaps for the first time. This is the initial step in hard wiring the culture of the Quadruple Aim into any group that employs physicians”, Drummond says. One 2016 training client was the Southern California Permanente Medical Group (SCPMG) – the physician arm of Kaiser in Southern California. All 6000 of SCPMG’s providers received the Burnout Proof Live Workshop and One Minute Mindfulness training in 13 separate all day training events delivered throughout the SCPMG service area. Additional training clients include Intermountain Medical Group in Salt Lake City, Utah and many others. - Collectively the coaches have now provided 2000 hours of one on one physician coaching to burned out physicians worldwide. “In 2017 we will be rolling out our Quadruple Aim Physician Leadership Retreat and our Outsourced Corporate Burnout Coaching Services. There is no time to rest as further consolidation in the healthcare industry and uncertainty of what will happen to the Affordable Care Act will only add to the stresses on physicians in the coming year. 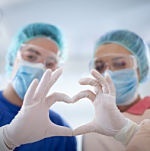 TheHappyMD.com is the premier source of coaching, training and consulting to prevent physician burnout. CEO, Dike Drummond MD is an executive coach, trainer and consultant with an international physician clientele. 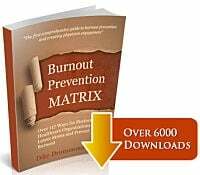 He is the author of “Stop Physician Burnout – what to do when working harder isn’t working”, creator of the “Burnout Proof Live Workshop” and the “Quadruple Aim Blueprint”, a system-wide, proactive burnout prevention strategy. Dr. Drummond has trained or consulted with over 60 major healthcare organizations in the last two years alone.